One of the best ways to search for jobs is using online resources, specifically the internet. There are thousands of job websites out there that provides employment opportunities in a variety of fields. The problem with this is that you can be overwhelmed with so much sites to choose from, so in this articles we will name the top 5 best places to search for jobs. Online jobs for Americans is one of the top recommended online jobs resource. If you are looking to work from home and work online from anywhere in the world, then www.onlinejobsforamericans.com is one of the best places to find online jobs. There are many benefits from working online from home, the benefits includes: flexible schedule, work from anywhere in the world, spend more time with you kids, no more commuting to work etc. To work from home, all you need is a computer and internet. 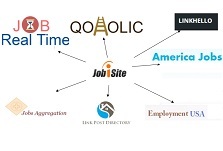 The job categories that you can find on www.onlinejobsforamericans.com are design, admin, customer service, bookkeeping, virtual assistance, data entry, legal, marketing, sales, writing and translation, website development, research, IT and networking and more. LinkedIn the most popular professional service in the world. With LinkedIn, you can search for jobs, follow companies who you are interested in and is relevant you your job search, join groups, follow contacts who are advertising vacancies, etc. You will need to create an account profile on LinkedIn and you can add portfolio samples to your profile. Monster has one of the largest catalog of job listings. With Monster you can search and apply for jobs, upload your resumes, get salary information, review company profiles and get career advice. They offer networking board and also a job alert service where you can get jobs alerts delivered to your email inbox. Indeed has millions of job listed on their website. On Indeed you can search for jobs, upload your resume, and get information on job trends and salaries. Also you can personalized resume link to share with employers information about the companies you are interested in. Career builder is one of the biggest job boards around. You can search for job by pay range, college degrees, location, etc. It also provides resources of candidates and career advice. On Career Builder you can also upload your resumes.